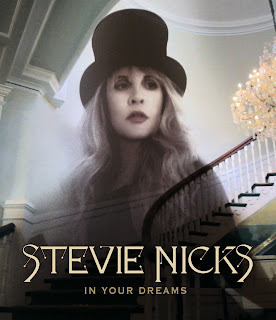 Stevie Nicks ' movie In Your Dreams, which documents the creation of her album of the same name, is out on DVD this week. More than just your standard "making-of" film, In Your Dreams captures the surreal atmosphere at Stevie's L.A. mansion, where she, her producer Dave Stewart and various friends and associates lived and worked while recording. The idea, says Stevie, was to give fans a truly immersive experience. "We wanted people to feel like they were making the record with us," Stevie told ABC News Radio at her home in L.A. "We wanted people to feel like they were here in this house with me and Dave and all the characters that were here -- the singers, the chef, my goddaughter, my assistant, all the people that did all the hard work around us to make it easy, all the techs, everybody." "There was a lot of people here every day," she adds. "And if any of my friends came into town and wanted to come over, it was fine. I don't think I've ever been in a situation like that before." In fact, it was quite a freeing experience, because as Stevie explains, making a record with her band Fleetwood Mac pretty much requires everyone to be on lockdown. "When you're recording with Fleetwood Mac, it is not fine to invite all your friends over. No. It's very closed. It is a secret society...it is not cool," she tells ABC News Radio. "You don't just say, 'I'm coming with 10 friends.'" Speaking of Fleetwood Mac, the band was forced to cancel their Australian and New Zealand tour when bass player John McVie was diagnosed with cancer in October. But Stevie tells ABC News Radio, "He's doing great...if I ever had any psychic knowledge about me in this body, I am telling you that John McVie is gonna be just fine." In fact, Stevie says John will be with the band when they play three shows in Vegas starting December 30. Then, she says, "He's gonna have a little operation....he'll probably take a couple weeks to recover, and then...sky's the limit!" As for John's ex-wife Christine McVie , who left Fleetwood Mac in 1998, what does Stevie think of her recent comments in the British press that she'd rejoin the band "if she was asked?" Well, according to Stevie, Christine doesn't need an invitation. "It is her band. If she wants to come back, she will come back," Stevie tells ABC News Radio. However, she says Christine needs to know what she's getting herself into. "The only thing I said to her was, 'Understand how physical this is. This is a two-hour-and-40-minute set....this is a grueling set,'" Stevie reveals, adding that she also told Christine, "Just be sure that you want to do it, because you can't come in and out if you come back!" Stevie will meet and greet her devoted fans and sign copies of the In Your Dreams DVD on Wednesday at the Barnes & Noble at Farmer's Market, Hollywood. Look for her there at 7 p.m.
As someone who lives in Las Vegas, I'm ecstatic to hear that "Stevie says John will be with the band when they play [the] three shows in Vegas starting December 30," that's FANTASTIC! Moreover, it's really exciting as a long-term Fleetwood Mac fan to hear that 'Christine doesn't need an invitation,' as Stevie says, "It is her band. If she wants to come back, she will come back." 'Say You Will' Christine, 'Say You Will' !!!!! It would be fantastic if Christine would join them for the Las Vegas shows, and then go into the studio with new musical contributions along with Stevie, adding to the Mac songs already waiting in the pipeline, and put together a new Fleetwood Mac Album, followed by a 2014 Reunion Tour. I can't wait to see how this all plays out! Just when you think Fleetwood Mac has written its last chapter, the 'Planets of the Universe' align once again to reveal there is much more to come from this legendary band! 'The Sky Is The Limit'!!! If Christine is really interested in returning, I don't think she'll be fully integrated into the Vegas shows. The band has been working with an established set list all year, and with the exception of "Don't Stop" and occasionally "World Turning" they haven't played any of her songs since 1998. As Stevie has said the band should have been in Australia this past month, not back in the States, and with John taking time to recover rehearsing a new set would be highly unlikely. I would imagine her return - if she recommits to the band - would be in the studio. If she comes back I can't see Stevie saying no to a new Mac album. Ha, it would take no time for Christine to get in the swing of things. Those "sets" are some of the same dang songs that she collaborated with years ago. There is no reason other than Lindsey's ego that she could not come back.